Packed with Hi-fi Power, TX-8220 stereo receiver offers you more including Bluetooth, FM/DAB+ Tuner and connection to your Turntable, CD Player, TV or Media Streamer. 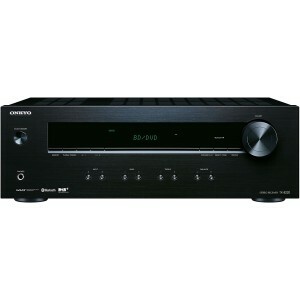 Onkyo TX8220 Stereo Receiver is a minimalist hub that merges universal connectivity with pure analogue amplification for sound quality that far surpasses its modest price tag. All essential digital audio inputs are included as well as four analogue line-level inputs for your convenience. TX-8220 incorporates MM phono input for turntable, DAB+ and FM/RDS radio tuners with 40 presets and built-in Bluetooth technology. Auto Connect gets your music flowing with a few taps while speaker A/B Drive and subwoofer pre-out lets you set the tone for your own speakers, customise a multiroom setup and boost LFEs in film soundtracks. Bass, treble and balance buttons are useful for adjusting the tone characteristics of your music for satisfying response with any speaker type. Carefully designed tone circuits which some receivers don’t include, let you personalise sound to taste with no perceived loss in audio quality.